Distribute the load on the cargo tie down rings evenly. Please observe the loading guidelines. • secure the load using the cargo tie-down rings. • do not use elastic straps or nets to secure a load, as these are only intended as an anti-slip protection for light loads. • do not route tie-downs across sharp edges or corners. • pad sharp edges for protection. • only use tie downs that have been checked in accordance with applicable standards, e.g. lashing nets or lashing straps. 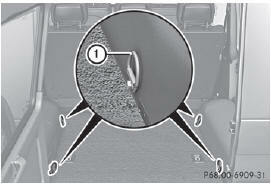 • fill the spaces between the load and the cargo compartment walls and the wheel mountings in a form-locking way. Only use dimensionally stable transportation aids for this, such as chocks, wooden fixings or padding. There are four cargo tie-down rings 1 mounted at the sides in the cargo compartment.